The direct indexical relationship between text and material is not only structurally embedded in the computer systems which manage, facilitate and entertain us, but rests in a history of science, belief, law and magic. While text is compiled in machine code, enacting the processes which turn on our street lights, render our videos and send data packets to the server, older societies performed other enactments of text, containing their own syntax and lexis. Religion, sorcerers, alchemists, writers of constitutions brought forth, with hubristic self-certainty, the world as we know it; spells, gold and human rights in that order. Burj Babil (Tower of Babel) is a video installation work. 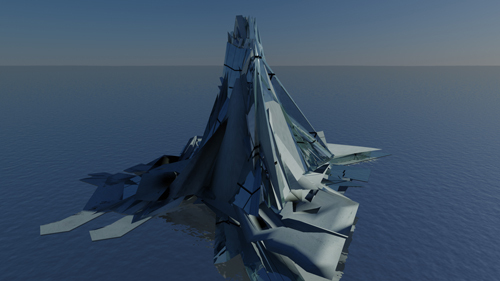 To create the tower, the source code file has been subjected to a number of transformation processes which corrupt and destroy the tower in different phases. The processes transform the vertex and face coordinates from the source code file into ASCII (American Standard Code for Information Interchange 2) characters. The results are then fed into language translation services (babelfish.yahoo.com). Most of the file is ignored since the sequence of characters do not correspond to real words. However when chance causes the ASCII sequence to form a recognizable word this will cause a corresponding physical translation of that vertex point. The resultant corrupted code is then used to re-make the model causing its eventual collapse. The final result of this process is a number of video sequences showing the destruction of the tower as its source code file is translated into different languages.